The Toyota AGV (Automatic Guided Vehicle) Product is designed to accommodate your needs for reliable AGV/AGC solutions at costs that make sense in today's global economy. Capacities range from 250 lbs. to 10,000 lbs. rolling loads. Guidance can be accomplished via magnetic tape or Laser Positioning technologies. Interface with WMS (Warehouse Management System) and ERP (Enterprise Resource Planning) systems are available. Category 3 Sensors are available for safety. Existing installations of the Toyota AGV products are available for reference and visitation by prospective customers. Toyota Tow Tractor: Capacity = 250 lbs. to 10,000 lbs. rolling load. Conversion technology is one of the more recent methods of AGV acquisition in the U.S. manufacturing environment. Many consider it a preferred automatic guided vehicle solution for its well understood and implemented improvements in AGV cost, durability, and support. TMHU has a unique record of ongoing success in this particular field mating the best Tow Tractor in the industry (8TB50) with the latest most sophisticated AGV conversion kit in the industry. Toyota's standard truck, with AGV kits added, is continuing to grow as the AGV of choice for many of our customers. Mouse: Capacity = up to 3,500 lbs Rolling Load - Highly maneuverable, compact, and able to share aisles with pedestrians and lift truck traffic the mouse is a versatile material handling solution. Using a pop-up pin load engagement system allows for an infinite number of ways to assist your company to reduce expenses and improve productivity. 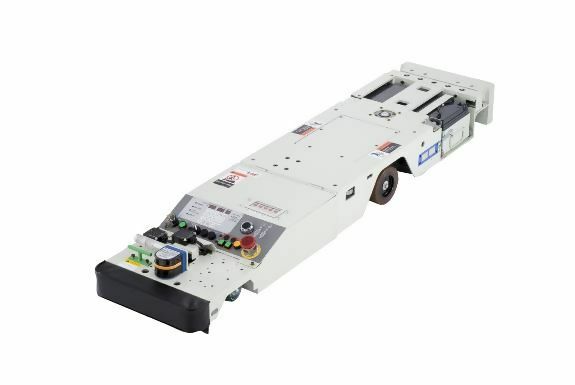 L-Cart: Capacity = 200 to 2,000 lbs Rolling Load - Toyota can provide a base drive package and allow our customer's to "build their own AGV" or allow Allied to manufacture a complete AGV/AGC with a traffic control system and an automatic charging station. Using a "bolt-on" style concept, a customer can attach a L-Cart drive unit to existing carts at their facility.